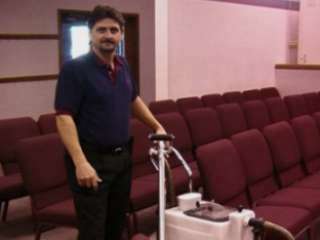 Cliff Stoker has been in the carpet cleaning business for approximately 18 years. Born in Metropolis, IL, he has lived in the Champaign-Urbana area since 1980. The Stoker family includes six children and a family dog. An avid musician, Cliff plays bass guitar in the worship band at Vineyard Christian Fellowship. His desire is to honor God in his personal and professional life. He enjoys meeting new people and looks forward to hearing from you soon. You can look for the Exact Extraction van and flag it down as it rolls through town or you can pick up the phone and give Cliff a call.